Info "Now this is a true classic! Spin the capsule to match the color of the viruses below, and form a row of four! Dr. Mario was released for the NES in 1990." 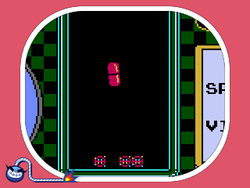 Dr. Mario is one of 18-Volt's microgames in WarioWare Gold. It is based on the Nintendo Entertainment System game of the same name. The player must tilt the system to correctly align a Megavitamin so that it takes out three Viruses at once. 1st level difficulty: The Megavitamin only consists of one color, and the Viruses are arranged horizontally. 2nd level difficulty: The Megavitamin consists of two colors, and the Viruses are arranged horizontally. 3rd level difficulty: The Megavitamin consists of two colors, and the Viruses are arranged either vertically or horizontally on the second-to-bottom row. This page was last edited on October 12, 2018, at 20:16.